Chillers are as essential to industrial products as the process equipment they cool. They protect valuable investments, products and plant infrastructure while keeping processes running at optimum efficiency. 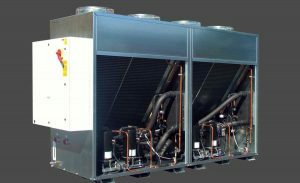 Whether used to cool a process critical to delivering prRedundant Refrigeration System Built by Dimlplex Thermal Solutionsoduct on time to a major customer, or simply to avoid the costs and disruption resulting from equipment failure, a chiller delivers. Many options exist when selecting a chiller for your process-specific needs. Matching process expectations with the appropriate chiller design will help achieve the highest level of availability, commonly referred to as uptime. Reliability describes the ability of a system or component to function under stated conditions for a specified period. Intuitively, it is easy to understand that a product’s design, the quality of materials used and the care taken during the manufacturing process all influence the quality and reliability of the products we select. Chillers are no different. If low cost components designed for relatively short lifespans are selected, then the reliability of the overall system will reflect those choices.